GMLAN is actually WHB for my car..according to the FSM. Not sure how I got GHB. The Aveo DIC is not much of a DIC when compared to the rest of GM's DIC's. I have no doubt plugging in a different cluster is what caused my problems. It is yet to be seen whether I'll be able to just do the relearns and go or if I'll need to do more. This is not my pic, but it is an Aveo with the DIC. Last edited by wylee; 08-31-2011 at 09:36 PM. Last edited by Ratchet104; 09-01-2011 at 02:28 PM. Yeah, I knew what they were. Thanks for posting the exact text though; it may help someone in the future who finds this thread. My problem was that I did not have a CANdi module to allow my Tech2 to talk to my car. All is well now; the CANdi came yesterday and I did both learns today. I wish I knew where to hook up to the back of a GM-LAN car IPC. All the postings I found on the Russian Aveo Club site shown non GM-LAN cars. I've uncovered the DIC in my car, but without unsoldering the lcd screen and separating the printed circuit board from the white plastic I can't tell where the connection would need to go. I have an 08 Aveo5 LT - do you think mine would also have this "hidden" gem? If so, which information displays - mpg (current/live)? temps (in/out), etc? Seems to me I saw a Chinese-version replacement for the instrument cluster in a forum/thread somewhere, but cannot find it again: My odometer is "pixelating" on occasion, and from what I hear there's no individual component replacement available: Dealer advises $200 ~ $500, depending on the number string from the back of mu factory cluster... and suggestions? It is almost guaranteed you have the DIC hidden, but without a way to change the display, all you'll get is estimated miles to empty. As far as changing the cluster, If you can get a new one for $300, it would probably be cheaper than getting a used ($50 - $100) one, getting the mileage (~$150) corrected, and then going back to the dealer ($30 - $150) for the relearns. Thanks, Wylee! Would the new one from the dealer (mileage corrected) require "relearns", too? Reading the above links it seems that they were able to add the controls (as least, I THING so: the translations were pretty bad)?? If I pull my present cluster to simply replace a bulb (odometer), do I need to disconnect the positive battery terminal, and will THAT require "relearn", too... or are the bulbs accessible by simply popping the plastic cover off, removing the screws and tilting the entire cluster forward far enough to remove and insert the replacement bulb WIHTOUT completely disconnecting everything? In my 2010, the bulbs are not bulbs; they are led's soldered on the circuit board. As far as relearns with the new cluster, they would probably need to be done but that's not a big deal. When the dealer installs a new cluster, they use the Service Programming System to transfer the mileage from the old cluster. With the car already hooked up for the programming, the relearns will hardly make any difference in the labor time. I unplugged my cluster again after I did my relearns to correct the pins (I didn't get the tach and speedo pins on quite perfectly when I had the cluster apart) and I did not have to do the relearns again when I plugged it back in. I don't have any personal experience with an 08, so hopefully someone else can chime in to confirm whether 08 and 10 are close to the same. 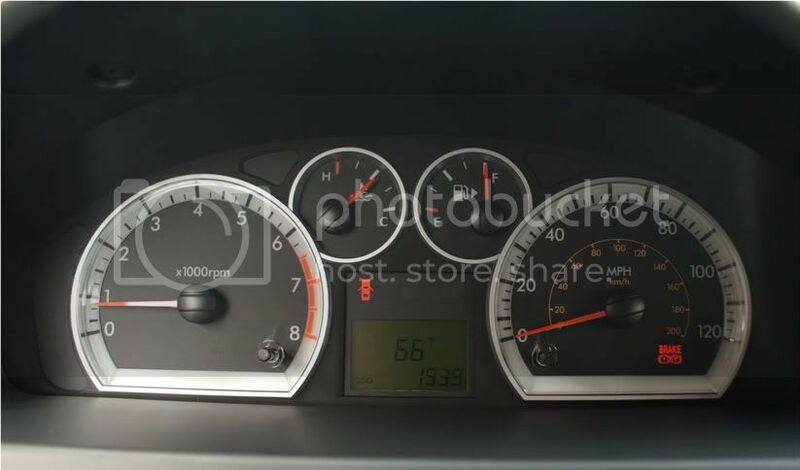 Your cluster does look like the one in post #22 minus the button in the tach, right? Last edited by wylee; 09-01-2011 at 04:51 PM.